A few years ago, my friend Valerie made this cake to share with some friends. The moment I tasted it, I asked her if she would share the recipe. This is an absolutely perfect cake that takes very little effort to make. No icing, no topping, nothing else is necessary at all. It was reminiscent to me of a coffee cake in texture but much lighter than the typical heavy version. This might be the only cake I’ve ever tasted that basically screams holidays to me. It is pure heaven to eat. I made nine different desserts for a Thanksgiving event the first year I made this cake and this was my absolute favorite, by far. That hasn’t changed in the 5 or more years since we first tried this cake. While I have no problem sending almost all other leftover sweets home with friends and family, I always save a few small pieces of this once just for myself. This Cranberry Christmas Cake is one of my all-time favorite treats to enjoy with Cafe con Leche in the morning, afternoon or evening. I’ve learned to stock up on cranberries each year. That way I will always have them in my freezer and we’ll be able to enjoy this cake throughout the year. You’ll be wishing you had a few bags stashed in the freezer as well, just as soon as you take the first bite of this Cranberry Christmas Cake! BEFORE YOU BAKE THIS CAKE – please read through the frequently asked questions. If you do have a question, please read through those questions. The odds are good that the question has been answered many times already. Yes, you will use fresh, raw cranberries for this recipe. They will soften and burst as the cake bakes. 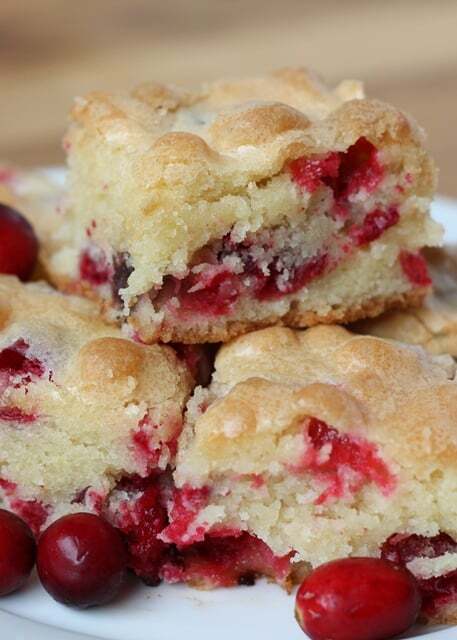 There is a good bit of sugar in this recipe and it balances the tartness of the cranberries. Yes, you can use frozen cranberries. I buy multiple bags of fresh cranberries every year when they start appearing in the stores. Just toss them straight into the freezer to have them on hand through the year. I use frozen cranberries almost every time I make this cake. However, the dough will “freeze” up a bit and become even thicker and it will be somewhat more difficult to stir in the cranberries. I find it easiest to let the frozen berries thaw on the counter for a little while as I’m beginning to prepare the cake. This is a very thick batter that will resemble cookie dough when it has finished mixing. You will need to press it into the pan to spread it out. There is no baking soda or baking powder needed in this recipe. The extended beating time for the eggs provides the necessary leavening for the cake. Do not shorten or skip the beating process. If you read through the comments, you’ll see countless variations that I’ve made and other readers have made for this recipe. Blueberries swap nicely for the cranberries. Adding nuts to the recipe works too. The addition of orange zest, orange extract, or almond extract works nicely as well. 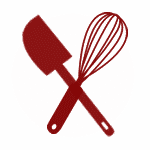 The gluten-free substitution is listed in the recipe notes. The cake can be made in a variety of different cake pans. It can also be made into cupcakes and mini loaves. Watch the baking time and adjust as needed. One of the most frequently asked questions is whether you can bake this in a bundt pan. I do not personally recommend that. Yes, many people in the comments have said that it works, and I’ve tested it in a bundt twice myself, however, it isn’t the same cake that way. (Once it fell apart on me and another time it worked fine.) If you do decide you must use a bundt pan, grease the pan HEAVILY with butter and then flour the pan generously. The biggest downside to baking this cake in a bundt pan is that you will miss out on the best part, that lovely crust that forms on the top of the cake. There is no glaze on this cake. The crust forms as the cake bakes and winds up looking as pictured in the photos. I store this cake at room temperature, either uncovered or very loosely covered. This is a moist cake and the crust will soften a great deal if it is stored airtight. It will still be tasty, but it won’t be the same the next day if it’s kept airtight. If you freeze this cake, thaw it uncovered at room temperature if possible. For more ways to use cranberries, check out these Cranberry Brownies. I think they’re my favorite brownies ever! Cranberry Pepper Jam is a year-round favorite. I make as much as possible each time I can get my hands on cranberries. On a fancy cheeseboard or just on a cracker, this jam rocks. Nantucket Christmas Cranberry Pie and this Cranberry Apple Tart are both great new ways to make the most of the available cranberries during the holiday season. Cranberry Pistachio Snack Mix by Foodie with Family and these Cranberry Rolls with Orange Icing by The Noshery are holiday favorites too. Cranberry Ginger Sugar Cookies by 365 Days of Baking and Cranberry White Chocolate Shortbread by Love from the Oven are also on my list to try soon. 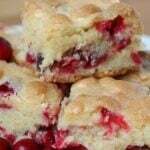 I recommend stocking up on plenty of cranberries so that you can enjoy these recipes all year long. With a mixer, beat the eggs with the sugar until slightly thickened and light in color, about 5-7 minutes. The mixture should almost double in size. The eggs work as your leavening agent in this recipe, so do not skip this step. The sugar and egg mixture should form a ribbon when you lift the beaters out of the bowl. Add the butter and vanilla; mix two more minutes. Stir in the flour until just combined. Add the cranberries and stir to mix throughout. Bake for 40-50 minutes, or until very lightly browned and a toothpick inserted near the center of the cake comes out clean. (I baked mine for 43 minutes.) Let cool completely before cutting into small slices. I cut mine into fairly small pieces, about 1″ x 2″ so that they could be easily eaten at a party. 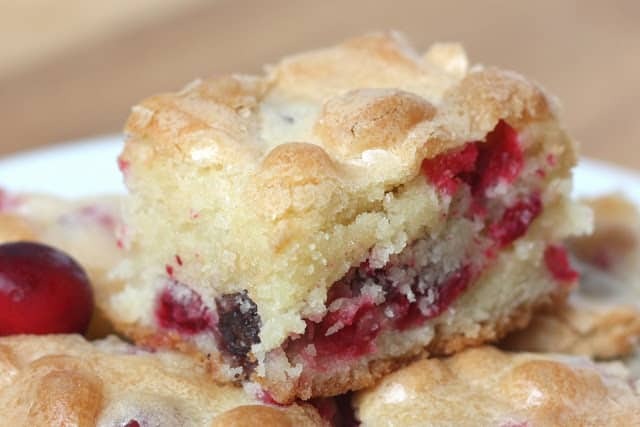 Tart fresh cranberries and sweet buttery cake are perfectly combined in this popular Christmas dessert! Spread in a buttered 9x13 pan. (This pan is my favorite!) Bake for 40-50 minutes, or until very lightly browned and a toothpick inserted near the center of the cake comes out clean. (I baked mine for 43 minutes.) Let cool completely before cutting into small slices. I cut mine into fairly small pieces, about 1"x2", so that they could be easily eaten at a party. Enjoy! Gluten Free Substitution: 1 1/4 cup brown rice flour + 1/2 cup potato starch + 1/4 cup tapioca starch + 1 teaspoon xanthan gum may be substituted for the amount of all-purpose flour listed in the ingredients above. Can I substitute granny Smith apples in place of cranberries? I have no idea how that might work. It's worth a try though. If you do try it, please let us know how it turns out. Made this for a small office gathering, not at all Christmas related. It was a big hit. Take care when combining the eggs and sugar. If you are like me you’ ll Be tempted to stop before they are light enough. Follow the instructions and wait until they almost double in size. Otherwise this is a quick coffee or tea cake recipe with good results. My pan was a bit smaller than suggested. I watched the oven closely towards the 40 minute mark and it was done in 50 minutes. Fantastic cake. Great recipe. Everyone in my family loves it. I even carried a package of cranberries to Ghana, Africa and baked another one. No cranberries available here so what a treat we had. Thanks so much for sharing your recipe. I am so happy you took this to Africa! I had the opportunity to visit Ghana when my daughter was in the Peace Corp in Togo. What a special treat you took with you!! Could you use dried cranberries ? Can dried cranberries be used? Dried cranberries will not work the same way. Tried this recipe yesterday. Followed instructions but came out more like a cross between a hard cookie. Crust is dense without leveling. Almost like biscotti but not as dry. Perhaps I baked it too long.Crust is very sweet with two cups of sugar. Prefer a carmelized orange sauce.May try altering recipe to my preferences. My dough did not double in size despite letting my mixmaster rip for 7 minutes.. Plan to add leveling next time! Another thought: from Bluebird:Did not sift the flour. Is this why my recipe turned out so dense?? Hi, Bluebird. I don't typically sift the flour for this recipe. 7 minutes of beating should have been plenty of time to result in eggs that would leaven the cake. Without being in your kitchen with you, I can't really guess what went wrong. This will definitely be in my favorites for sweets to bake! It was easy to put together and it is delicious. I certainly hope there's something left for book club tomorrow. I can't figure out how to attach a picture unfortunately. Thanks for the goodness! I'm thrilled you are enjoying the cake, Chris! I love this comment! I'm so happy that you enjoy the cake so much. Can blueberries be used instead of cranberries? Yes, this does work with blueberries. Happy baking, Holly! Make this cake at least twice a month. Stocked up on frozen fresh cranberries since none available during the year. GrandKids love it. And so do company. I stock up every chance I get, Frank! I'm so glad you like the cake. I made this cake three times over Christmas and it is awesome.Question - could I substitute blueberries for the cranberries? Yes, you can substitute blueberries for the cranberries in this recipe, Roz. Yes, this works nicely with frozen cranberries, Lucy Ann. Enjoy!